Most producers who fail at pasture-finished beef do so because pastures are overgrazed and forage availability eventually runs short. The author is a dairy nutritional consultant and freelance agricultural writer based out of Connecticut. Pasture-finished beef is becoming more popular among consumers. However, finishing beef solely on pasture grasses with no grains requires a very aggressive level of pasture management throughout the grazing season. Pastures must supply enough feed to support both a desired growth rate as well as putting adequate fat on the animal at the time of slaughter. 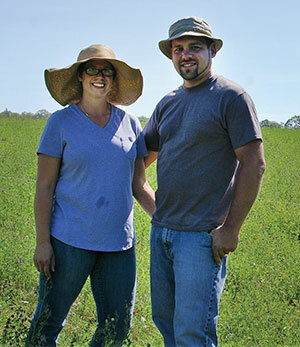 Jennie and Dan Kapszukiewicz improved pasture growth and soil health by creating smaller paddocks. In Plainfield, Conn., Jennie and Dan Kapszukiewicz began raising grass-finished beef in 2012 with a pair of Black Angus-Simmental heifers. After having grown hay on about 33 acres of their property for many years, the couple decided it would be a more sustainable use of the land by putting it back into pasture, improving the soils, and raising the kind of meat that they preferred. The initial plan was to rotationally graze their two cows on 3-1/2 acres that was divided into four paddocks. They began with a popular intensive grazing model of keeping the grass short for higher protein. Pastures were then allowed to regrow back 4 to 8 inches. They did that for two seasons, adding a couple of calves along the way. As the animals romped around the large paddocks, they were gorging themselves with high protein but not allowing the grass root systems enough time to recover and regrow. Hay had to be supplemented to keep the animals fed. The following year, after attending a grazing conference, Jennie and Dan learned that the key to a successful rotational grazing system is to graze “tight and tall.” So the same 3-1/2 acres were then divided into 12 paddocks. They were amazed at the difference in the regrowth and how much more grass there was as the smaller paddocks had more time to recover. It didn’t take very long before they also noticed a dramatic improvement in soil quality as well. Previously, when Jennie attempted to push the pigtail hot-wire stakes into the ground when moving electric wire, she needed Dan’s help because the soil was so compacted. Now she has little or no problem relocating stakes as the soil has softened with the improved grass growth. During the 2016 grazing season, they expanded the number of paddocks to 19, measuring 320 feet long by 25 feet wide for a total paddock size of 8,000 square feet each. This year they have a total of nine animals (heifers and calves) on the same 3-1/2 acres that four years ago couldn’t support two cows. In the springtime, the grass is growing rapidly and there’s lots of it, but the cows are still moved to a new paddock every four to five days. Jennie and Dan are no longer concerned about the grass getting too long or mature. In fact, by having a portion of the grass left behind that’s more mature and fibrous, the cows have the ability to self-regulate their forage selections, which enables their rumens to function better. Jennie says that back when they first started grazing, the cows had loose manure due to the low fiber in the grasses they were consuming — that’s no longer the case. Dan noted that the stocking density per acre along with the pounds of beef produced per acre continue to improve. He estimates that the nine animals in the herd are consuming between 200 to 240 pounds of dry matter per day. This equates to as much as 7,200 pounds of dry matter consumed per month. 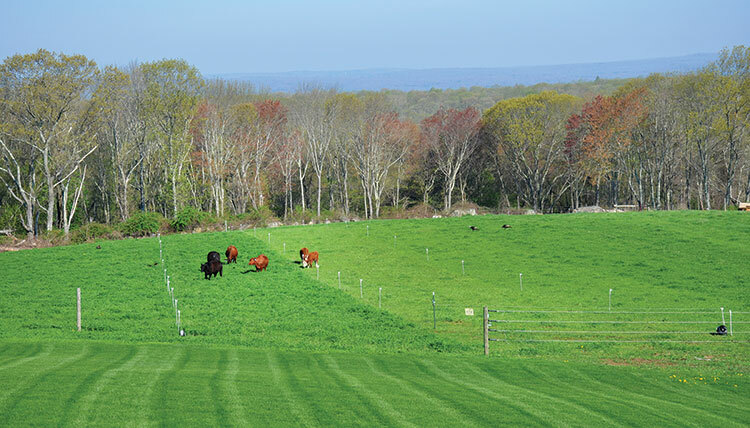 In spite of a very hot and dry summer in Connecticut in 2016, dry matter per acre well exceeded 1 ton per acre on the rotationally grazed pasture. The Kapszukiewiczes are convinced that creating the smaller paddocks was the key to the healthier soils and improved pasture growth. Dan adds that the decision to let the grass grow longer actually provides a canopy shading for the ground, retaining moisture in the soil that helped keep grass growing during the extended dry period this past summer. Jennie also noted that the cows have not had any problems with intestinal parasites since moving to the longer rotation and breaking the life cycle of the worms. They do continue to test for parasites each year just to make sure but have never had to treat the herd for parasites. Flies are still a problem during the summer months, and a future plan for the farm is to add chickens that can follow behind the cows when a paddock is emptied and dispose of the fly larvae in the cow pies. While the herd is not fed any grain or commodity by-products, they do receive some mineral supplementation. During the winter months while the pasture is dormant (and covered with snow), they are fed baleage that Dan continues to grow on the remainder of the property. The cows are usually back on pasture by early April. Pasture management is a work in progress as Jennie and Dan learn which varieties of forages grow the best. Currently, the pasture is a combination of timothy, fescue, and orchardgrass along with some alfalfa and clover. Managing and observing the paddocks and grazing patterns of the herd are pretty much daily chores for the couple as they monitor grass growth and move electric line from paddock to paddock. They also weigh cows every week to monitor daily gains that document the progress they’re making. As expected, average daily weight gains vary through the course of the season, with higher gains coming from the springtime forage and lower gains later in the season. They’ve also been able to document weight loss during hot spells. Overall, however, their cows have managed a consistent average daily gain over the entire season — for multiple seasons — of over 2.2 pounds of gain per day. A steer they shipped at 18 months of age last year weighed 1,375 pounds when it went to slaughter. Minus birth weight, the average daily gain for that steer was 2.3 pounds per day — solely on grass. Jennie and Dan are looking ahead to ultimately grow their herd to about 40 animals and marketing about 15 steers each year using the majority of the 30 acres for pasture. They have decided to phase out the Simmental bloodline and focus on Red Angus. They feel that the Red Angus works better in their grazing environment. 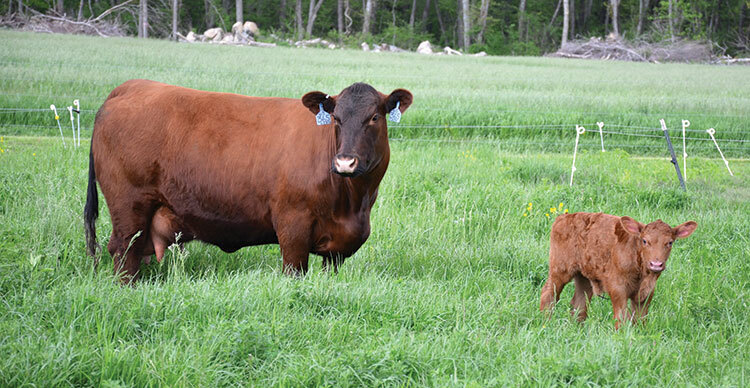 A key aspect of pasture grazing and finishing beef is being confident that the breed is matched to the pasture and the pasture can support the stocking density and growth rate needed to attain the quality of beef the market is looking for. After four years of experience and with all of the data that’s been collected, Jennie and Dan feel confident that they can produce a consistent product for much of the year and that their grazing model is working. This article appeared in the March 2017 issue of Hay & Forage Grower on pages 22 and 23.